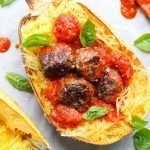 When I made this Stuffed Spaghetti Squash and Meatballs, I was at the end of my rope. The week has been a doozy. Between work, my boys and me getting sick, and staying up all night with a teething baby, I was exhausted. I was beyond exhausted by dinnertime. But whenever I walk through a week like this, my biggest takeaway is a good reminder to make sure I always have a few clean meals at the ready. That’s why big-batch recipes like this are in my regular rotation– I can cook once, eat some, and freeze the rest for later. 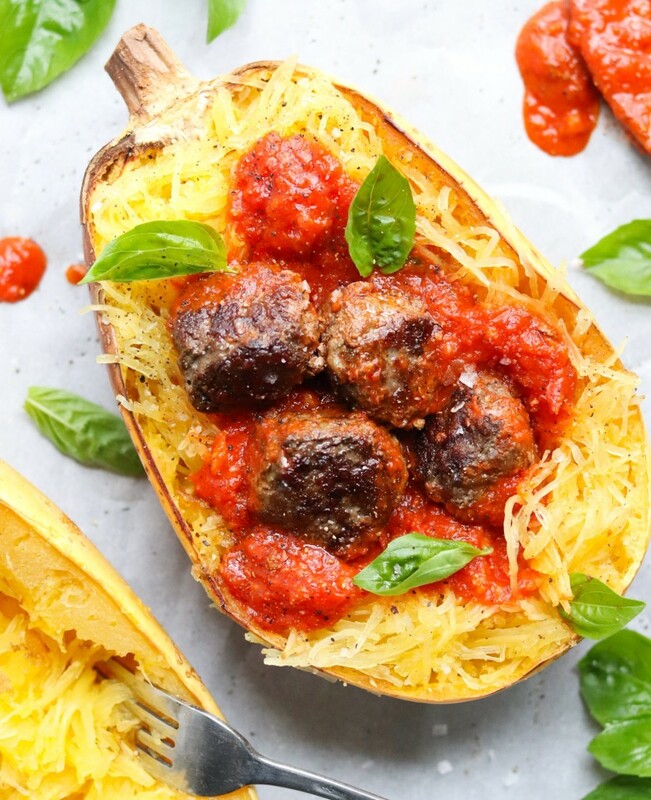 Then, when the inevitable happens.. you know, sick kids, extra projects at work, gigantic meteor propelling toward earth, etc., I can just easily pull these meatballs and squash right out of the freezer for dinner. 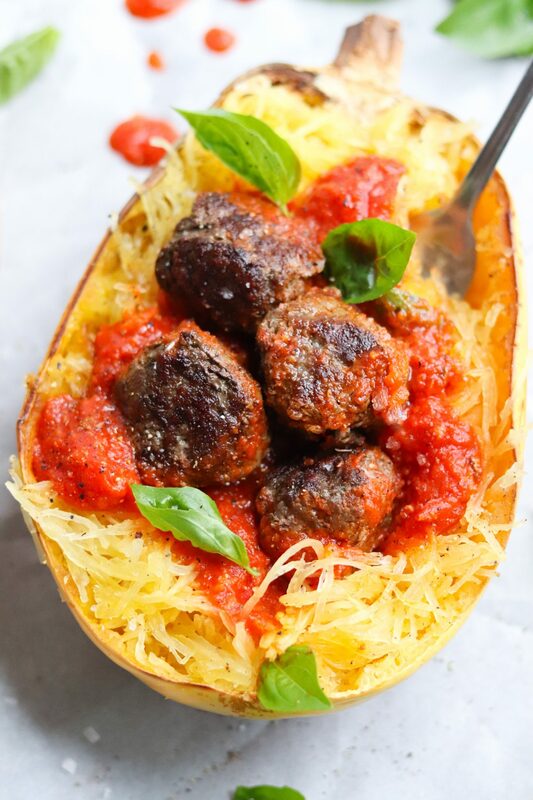 My kids really love making the spaghetti squash with me. They take turns fluffing out the squash with a fork, “making” noodles. It’s a great easy activity if you’d like to include them in the cooking process! I’ve been making this recipe since I got married almost 10 years ago, and I haven’t changed much, except occasionally switching out the homemade sauce for a store bought compliant one. And that’s a NICE thing to do for yourself every now and then. Because whatever works for you works just fine. I got to try ButcherBox this week – and the grass fed ground beef was perfect for making meatballs! Preheat your oven to 350. Wash squash and cut in half from top to bottom. Scoop out seeds with a large spoon. Place each half face down on a cookie sheet and cover the bottom of the pan with water, about 1/2 cup. Bake for 30-40 minutes or until you can easily slide a knife through. Allow to cool slightly. 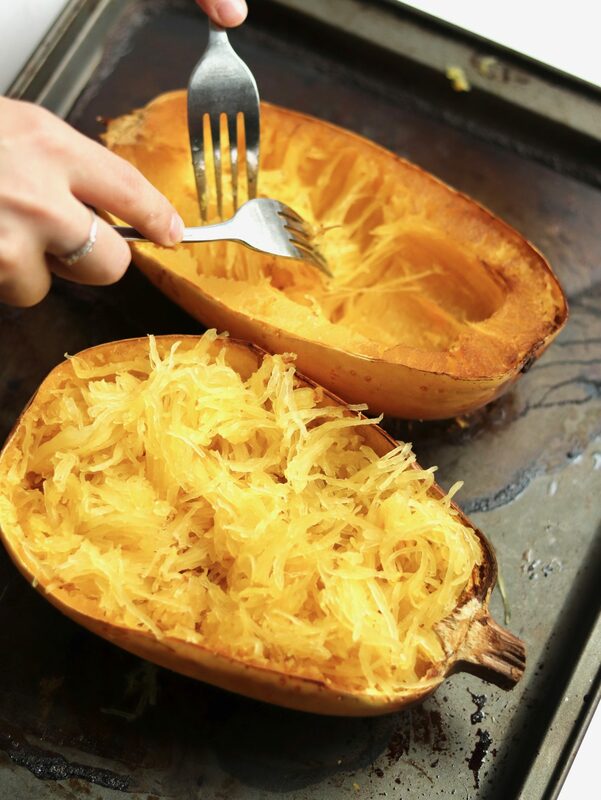 Use two forks to gently pull the squash back from the skin, fluffing it a bit. Pour 1 cup of sauce into each half and mix with the squash. 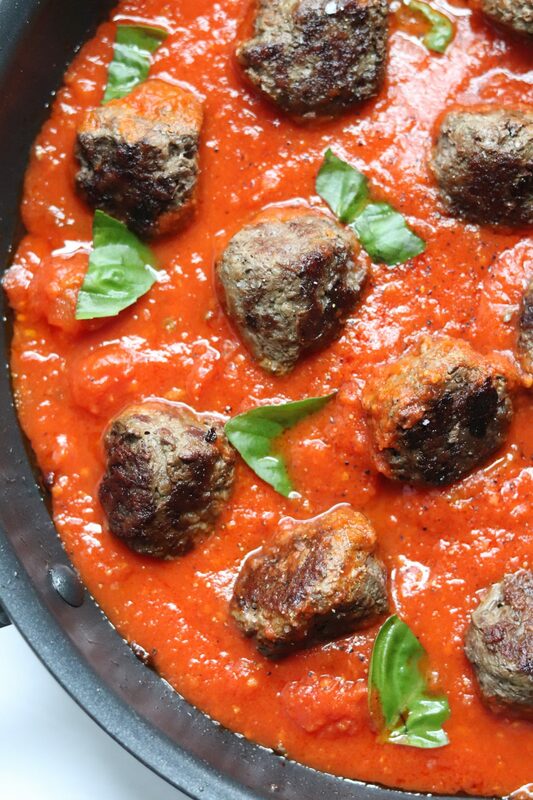 Fill each half with meatballs and top with marinara sauce. Put them face up on the cookie sheet and bake for another 5-10 minutes to be hot for serving. In a large stock pot, heat the oil over medium heat. Roughly dice and onion and garlic, and add to the pan. Allow to cook, stirring occasionally, for about 3-4 minutes or until fragrant. Add all ingredients. Bring to a low boil and simmer uncovered 2-3 hours, stirring occasionally. Remove bay leaf. Blend the sauce in a blender until you reach desired consistency. Preheat oven to 350. Finely mince the onion, garlic, and parsley. Add all ingredients to a large bowl. Using your hands, gently mix together until combined. Roll 1/4 cup portions between your hands to make golf ball sized meatballs. Place meatballs on a foil lined cookie sheet and bake for 20-25 minutes or until cooked through.